This is happening this weekend! Check the symposium schedule here. 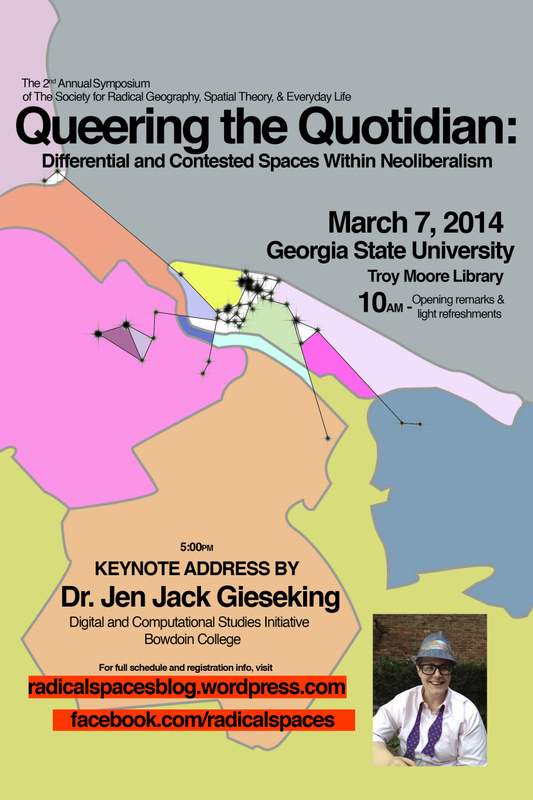 I’ll be presenting a short talk entitled “Beyond Outsiderhood: Rethinking Tropes of Gender Non-Conformance,” focusing on the limitations of understanding trans* and queer subjectivities through the spatial metaphors of margin and center, particularly within a neoliberal milieu wherein queer embodiment and identity are complexly entangled with big pharma, reductive sexological strategies of diagnosis, and a dimorphic cultural imaginary that compels certain concessions and complicities as survival strategies. I’m stoked to be presenting on a panel with my former colleague Colin Johnson, over at Indiana University, who’s recently been working on issues related to anti-sociality, and hear vidoegame/philo-nerd Cameron Kunzelman’s new research on the geography of gamespace. If you’re at all close to ATL, come join us!